Jesse Talbott is a songwriter and the lead singer in Dr. Bacon, a band originally from Boone that relocated to Asheville in 2016. It’s difficult to pin down the musical style of Dr. Bacon; that challenge arises from the fact that the group’s musical journey has been punctuated by a number of genre shifts and personnel changes. 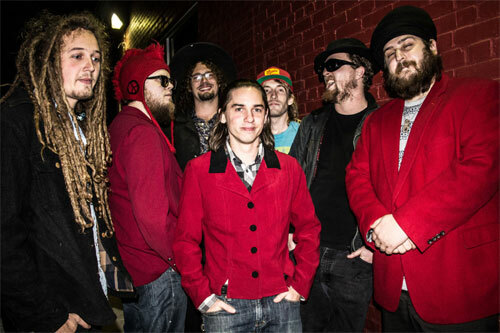 The band – which describes its current style as funk rock – played Asheville’s Isis Music Hall on February 18. So the early lineup of Dr. Bacon developed what Talbott describes as a “punk bluegrass style,” with an emphasis on danceability. That acoustic trio lineup featured two guitars and a mandolin, with one of the guitarists occasionally switching to djembe. Once settled in Asheville, the band entered a recording studio in early 2016 to cut an album. But not long after it was completed, the band faced yet another challenge. They had already been chosen to take part in the 2016 “Last Band Standing” competition when “our bass player, the drummer and the banjo player all quit,” Talbott says. Three weeks before the high-profile event, the remaining members found themselves in a make-or-break moment. Those studio sessions remain unreleased. “We now have this product that we no longer even sound like,” Talbott admits. “We spent all the money and time for something we couldn’t even use.” Listeners who want to hear what the ever-changing band sounds like now can hear them at the Isis show in February. The band also has many live sets available online at archive.org and on YouTube. Dr. Bacon has completed a more recent EP that almost features the current lineup. “Our drummer got nabbed by Caleb Johnson, the 2013 American Idol winner, so we just got a new drummer last week,” Talbott explains. Meanwhile, the initial CD run of the new EP sold out quickly, so the band has pressed up more for sale at shows.